It took Obama weeks to embrace the 2011 Cairo protests that forced Egyptian President Hosni Mubarak from power. When the Gulf kingdom of Bahrain--a strategic ally and host to the U.S. Fifth Fleet--violently repressed a popular uprising, Obama took no action. Even in Libya, he at first stood by as rebels fighting Muammar Gaddafi's forces found themselves outgunned and on the run. Obama finally intervened only when Gaddafi's forces massed outside the city of Benghazi, threatening a slaughter of innocents while pressure mounted from France and Britain. Republicans latched onto this as "leading from behind," a phrase uttered by an Obama aide to draw a contrast with George Bush's pre-emptive cowboy diplomacy but which critics called an abdication of real leadership. Gaddafi's relatively quick downfall initially made the intervention in Libya appear a success. "[We've] demonstrated what collective action can achieve in the 21st century," Obama said. But the story would sour. Wary of trying to rebuild another Arab nation, Obama invested little in post-Gaddafi Libya, where rogue militias and radicalism flourished--including the militants who attacked an underguarded U.S. compound in Benghazi, the very city Obama had saved, killing Ambassador Chris Stevens and three other Americans. The Syrian uprising began in earnest around the same time as Obama's Libya operation. He watched Syrian President Bashar Assad's regime brutally respond for another six months but took no action. As the death toll mounted, observers who saw an "Obama doctrine" in the Libya intervention wondered, Why not Syria? Obama's aides say the comparison is futile. "The notion of a doctrine is good as an organizing principle for people thinking about foreign policy," Rhodes says. "But in government, it's impossible in practice." Syria was clearly a harder problem. Libya had shabby air defenses and offered a desert battlefield that made air strikes easy. Syria has densely populated cities, and Assad has serious firepower. Unlike Gaddafi, who had no close international allies, Syria boasts decades of military and intelligence partnerships with both Iran and Russia. 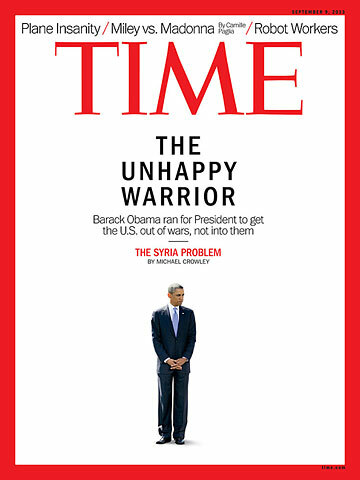 Obama waited until August 2011 to declare that "the time has come for President Assad to step aside." In hindsight, this may have been his first misstep in Syria. When Assad ignored the advice, the dictator faced no consequences. "He hasn't gotten the message," Obama told reporters a year later. More likely, Assad saw no reason to heed it. Not that Obama had great choices. Some argue that he could have escalated support for Syria's moderate rebel factions a year or more ago, before radical Islamists hijacked the uprising. Even at the end of 2012, top Obama officials, including Hillary Clinton and David Petraeus, were still arguing for this course. But Obama rejected their proposals, fearing the U.S. could do little to influence such a complex situation. He also worried about empowering al-Qaeda-affiliated rebels who could threaten U.S. interests more than Assad ever did. Now, even onetime supporters of such policies say the window has likely closed. "Syria today is not about choosing between two sides but rather about choosing one among many sides," none of whom share U.S. interests, Joint Chiefs of Staff Chairman Martin Dempsey recently wrote.